This rare cloisonné statue of a mythical animal is a late 19th century product. It is 10” high, 16” long and 8 ½” wide. 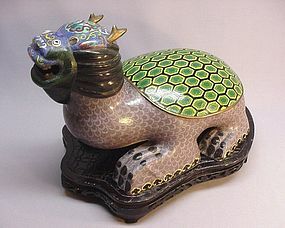 According to Chinese legend, an animal that has a dragon head and tortoise body is called “BaXia” (or Bixi) and is the oldest of nine dragon sons. BaXia is valiant and powerful; he has the strength to carry the heaviest of burdens. He has the body and shell of the tortoise, so it represents longevity and will bring good fortune. The carved wood base is 2” high, 15” long, and 11” wide from the widest part. Aside from old wear and a split on the wood base, it is in pretty good condition.